(Trent Nelson | The Salt Lake Tribune) Real Salt Lake hosts FC Dallas, MLS soccer at Rio Tinto Stadium in Sandy, Saturday July 7, 2018. Real Salt Lake forward Corey Baird (27), Real Salt Lake midfielder Albert Rusnak (11) and Real Salt Lake midfielder Damir Kreilach (6) celebrate a penalty kick goal by Rusnak. Sandy • Rivalries, when renewed, can have it all. On Saturday night at Rio Tinto Stadium, that was pretty much the case again. Before kickoff, before Real Salt Lake blew a 2-0 lead to the team from one state over, the club’s head coach was introduced on the massive jumbotron on the south side of the stadium. Instead of the sideline box, Mike Petke was seated in small mid-level section solo, alone on a row with a mug of coffee, as the fans inside roared when the PA announcer blasted his name over the system. Petke, who a week ago went viral in yet another postgame rant, shook his head. Soon, he disappeared to digest the rest of the night in a luxury box. That felt like the weirdest point of the 2-2 draw, the beginning. Far from it, actually. It was everything that came after that so often happens when two clubs who aren’t all that fond of each other clash. It got wild. Late goals, clattering tackles, yellow cards in bunches and, to top it all off, a massive midsummer thunderstorm that camped above the stadium and forced a lengthy weather delay. Oh, and another controversial call with video assistant referee (VAR). Of course. 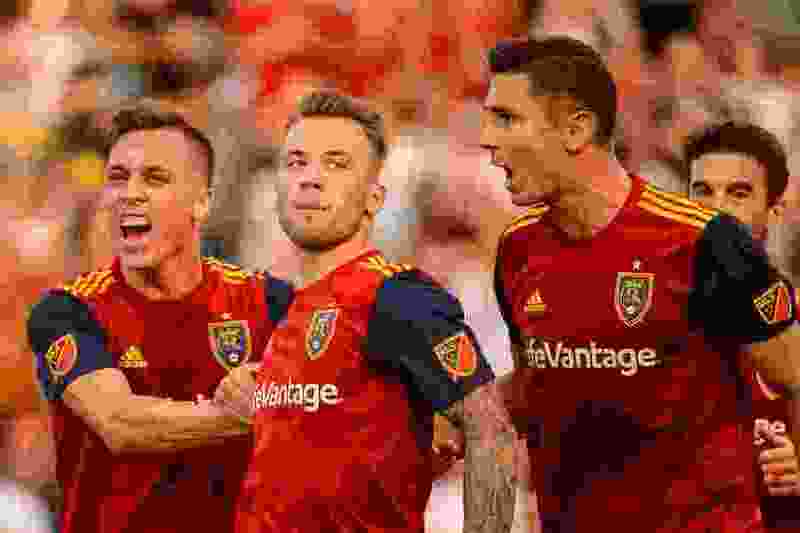 The 70-minute-long respite helped the Rapids, who in the first 25 minutes of action were adrift and unorganized, allowing RSL too many clean chances on goal as Joao Plata, a longtime torturer of the Rapids, carried the load early on. One week after providing two goals off the bench in a failed comeback attempt in the 3-2 loss at Minnesota United, Plata put a cross on a platter in the 11th minute, finding an unmarked Damir Kreilach on a run on the box. Kreilach easily nodded home his fourth goal of 2018. Six minutes later, Plata was the beneficiary of being alone, this time a few yards from goal. Before the ball ran out of play on the end line, Jefferson Savarino sent a low-driven cross to the far post where Plata was waiting. He scored his team-leading sixth goal of the season, powering a ball into the back of the net by a helpless Tim Howard. In 15 career matches against the Rapids, Plata now has seven goals, his most against any MLS team in the league. During the hour-plus delay, Petke, who is unable to stay in contact with the team during the match, took to his Twitter account and pleaded to fans to stay in support of the team. Those fans were, predictably, unhappy when referee Baldomero Toledo went to VAR and awarded a penalty to the Rapids in the 33rd minute, which Jack McBean put by Nick Rimando. “We were all over them and probably not for that break, we’d have four at halftime,” Rusnák said. The decision shifted the tide for the remainder of the match as Colorado pressured RSL with wave after wave of attacks, and eventually, the Rapids broke through in the 88th minute as defender Edgar Castillo slalomed through several RSL defenders, forcing Rimando to make a one-handed save, but substitute Dillon Serna was there to tap it in.ar Castillo slalomed through several RSL defenders, forcing Rimando to make a one-handed save, but substitute Dillon Serna was there to tap it in. Acting coach Freddy Juarez said the message to the players during the break was to make sure the Rapids don’t figure a way back into the match. But RSL, Juarez said, “didn’t adjust” to the Rapids’ post-break intensity. As for the overall lesson?